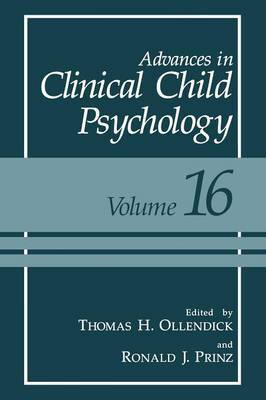 This volume of Advances in Clinical Child Psychology, which is the second under our editorship and the sixteenth of the series, continues the tradi- tion of including a broad range of timely topics on the study and treat- ment of children and adolescents. Volume 16 includes contributions per- taining to prevention, adolescents, families, cognitive processes, and methodology. The issue of prevention in child clinical psychology is no longer restricted to a few speculative sentences in the future directions part of a discussion section. Prevention research is actually being undertaken, as reflected in two contributions to the volume. Winett and Anderson pro- vide a promising framework for the development, evaluation, and dis- semination of programs aimed at the prevention of HIV among youth. Lorion, Myers, Bartels, and Dennis address some of the conceptual and methodological issues in preventive intervention research with children. Adolescent development and adjustment is an important area of study in clinical child psychology. Two contributors address key and somewhat related topics, social competence and depression in adoles- cence. Inderbitzen critically reviews the assessment methods and meth- odologies for social competence and peer relations in adolescence. Reynolds analyzes contemporary issues and perspectives pertaining to adolescent depression.